I’m not an emcee. I’m a content weaver. 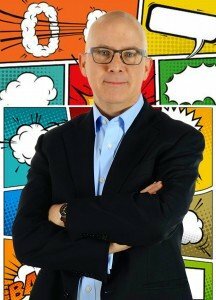 Yup, a corporate emcee is a valuable addition to your conference. We keep the energy going. We set up the audience so they are ready to LEARN from the next speaker. We are there to make sure the pacing is good. And that we stay on time. But wouldn’t be it be cooler if your emcee did more? What if they connected the dots for your attendees — helping them to make sense of the information they are receiving by connecting the General Session to the 2nd Breakout to the Closing Session? That’d be funny. That’d be useful. That’d be a great idea. That’s be…me. Content Weaver is what we call it. Check out this short video to explain. https://www.bradmontgomery.com/wp-content/uploads/2018/11/logo-1-495x198-1-300x120.png 0 0 admin https://www.bradmontgomery.com/wp-content/uploads/2018/11/logo-1-495x198-1-300x120.png admin2016-04-30 20:00:052016-04-29 20:28:47Corporate Emcee? Nope. "Content Weaver"
accordingly. Not only should he be aware of his tasks but should also be able to connect his roles with the specific event he’s officiating. A good emcee should know each of the speakers at the event by name and by face so that he can be able to introduce them to the audience without mistakes or errors. A good master of ceremonies should keep time and ensure that the event goes on smoothly and seamlessly. He should be able to adjust breaks and event transitions when he realises that the event is behind schedule. The age group and the type of audience at the event should be kept in mind by an emcee so that he can present the program and any other activities accordingly. A good corporate emcee should be able to read the mood of the audience and be able to make them focused on the event. He should be able to integrate an energizing activity when the attendees become too bored and calm them down when they are too excited. The role of an emcee is to ensure that all programs at the event progress smoothly and the sequence of the programs is seamless. When an aspiring emcee keeps all this in mind, then he is sure of delivering a seamless event program and thereby increasing his prospects as a successful emcee. Brad Montgomery is a business speaker and emcee. He uses hard-hitting humor (and his dashing good looks) to make sure that your people stay engaged. He works with you to geset up your ENTIRE meeting for success? Looking for an emcee to energize your audience? Like to get the most out of your motivational speaker by having him double up as the MC? Yay. I like that too. Give us a call at 303.691.0726 and we’ll plan how to customize and event just for you. Some of you know that before I became a business speaker I was a professional magician. Although I don’t do magic anymore – or at least extremely rarely – on the platform, I still consider myself a magician. For something fun check out this video of a magic trick I was playing with. I think it’s cool. What do you think? Leave a comment below. Have as few expectations about the future as possible. 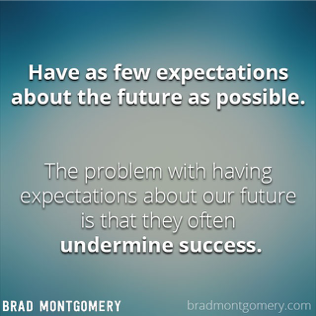 The problem with having expectations about our future is that they often undermine success. To oversimplify things, we have two expectations about the future. Either it’s some level of fear, e.g. “I’m anxious about this,” or “I’m worried about the upcoming event,” or we have over-blown optimistic expectations, (“This year’s vacation will be the best ever!” or “When I get the raise I’ll be incredibly happy.”) The crazy thing is that both styles of expectations are unhelpful to us. Clearly, having fear (or even mild concerns) about the future sets up up poorly. (And the worrying doesn’t help either.) But having super positive expectations is problematic too. Rarely are our super positive expectations met — hello dissappointment. Let’s talk about specifics. Let’s talk Prom. 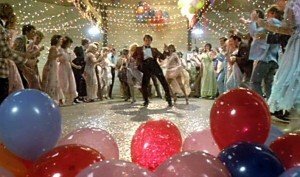 Every movie about High School has a perfect prom. The decorations, the music, the friendship, the tender slow dance and that awesome kiss with the right person at the perfect time with the EPIC soundtrack. So when our non-Hollywood kids head to prom, the expectations are high. They’ve planned, spent more money than they have (“Thanks Dad!”), and staged elaborate photo shoots. They are pumped! She expected nothing other than “It’s gonna be fun.” What a great approach. Real prom is a disappointment. 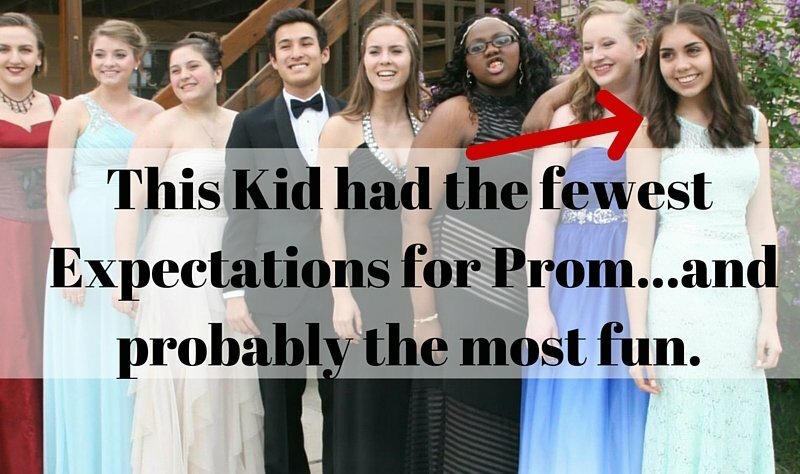 What If We Could Stage a Prom with No Expectations? Recently, my family had the pleasure of hosting an Argentinian exchange student. She is charming for a million reasons, one of which is that she has so few expectations of what to expect from American culture. Abi went to prom with her American girlfriends. (In other words, no awkward first-dates.) She got dressed up, and was excited, but didn’t know much about what to expect. Just that it was going to be fun. She had a blast — Everything was new and surprising to her, and she was delighted. Getting dressed up? Fun! Dinner? Fun! A ride in a limo with her buddies? Awesome! The dance itself? Fantastic! What struck me most about her experience was the complete contrast between her and all the Americans kids. She expected nothing other than “It’s gonna be fun.” What a great approach. No expectations are better than lots of expectations. Want to be stressed less? Want to focus on where you are? (As opposed to thinking about where you should be, or where you have gone?) Want to be happier? Do your best to lower and simplify your expectations to “It’s gonna be fun.” Not epic. Not horrible. No details. Just fun. Yup, you can plan. Yes, you can even rent the limo. (I’d take Uber.) But in the end it’s best to admit that you really don’t know what “it” will be like and embrace it. The best meeting in the history of meetings. The most satisfying holiday ever! I know this “outing” will be miserable. I just know it. Those are some pretty heavy expectations. They ain’t gonna help. Instead … Give yourself the gift of NO expectations. Your chances of meeting those expectations are 100%. Leave us a comment below. 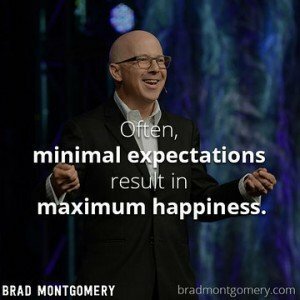 How do you manage YOUR expectations? Can you give us an example of how too many expectations handicapped you?